[Image: A cosmetically touched-up view of villages being set alight by mirrors; view slightly larger. 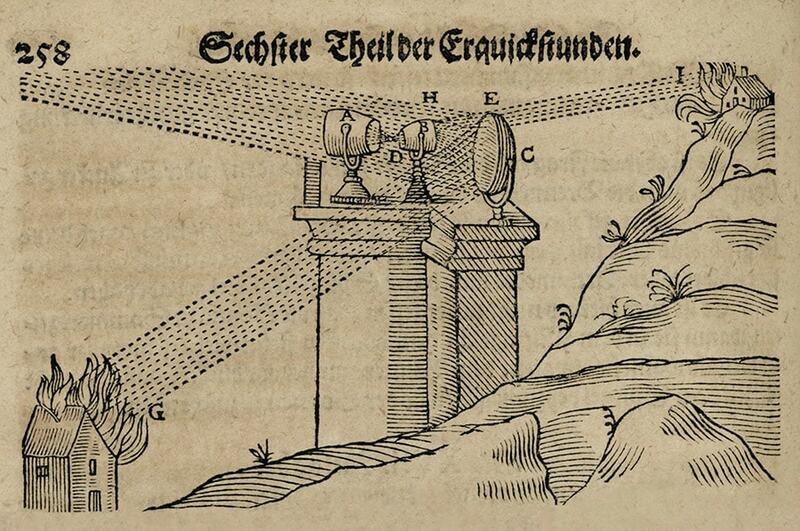 From Deliciae physico (1636) by Daniel Schwenter]. Perhaps you remember the Austrian village of Rattenberg, so thoroughly hidden in the mountain shadows every winter that it installed a huge system of mirrors to bring the sun back in. The town of Rjukan, Norway, recently experimented with the same thing. A far more sinister version of this exact sort of system was illustrated in a German book called Deliciae physico, published back in 1636, by Daniel Schwenter. There, a woodcut shows a kind of reflective super-weapon mounted atop pillars, made of concave mirrors and magnifying lenses, setting fire to two distant buildings simultaneously the way a bumbling child might torture ants. 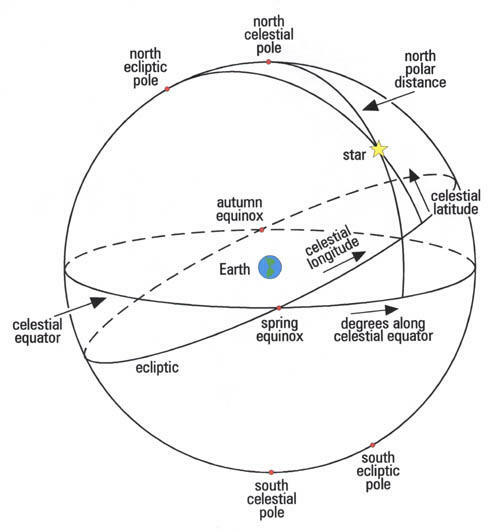 [Image: The full original page; view larger. From Deliciae physico (1636) by Daniel Schwenter]. 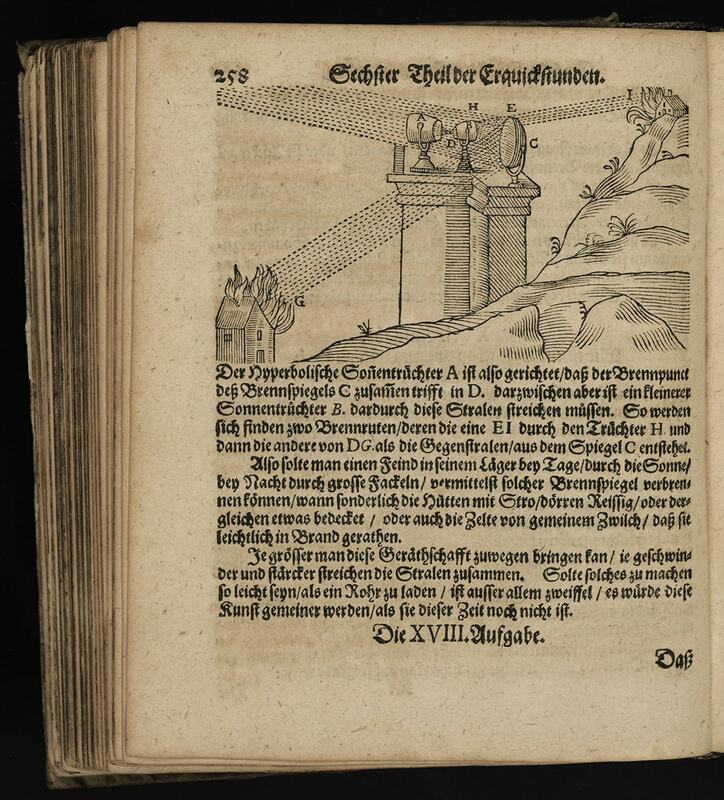 Interestingly, this Apollonian death ray—a frighteningly literal light brigade—is presented in the book’s much larger context of telescopes, astronomy, and other optical devices, including distorting mirrors and cameras obscura. Check out all 650 pages of the book here, courtesy of the U.S. Library of Congress, including some very cool images. (Originally spotted via the excellent Twitter feed, @HistAstro). [Image: Screen grab from Nocturnes]. Filmmaker Alec Earnest—who we last saw here for his short film about the death of a mysterious map collector in Los Angeles—is back with a mini-documentary about landscape painter Eric Merrell. The small crew used a new Sony A7S camera “that basically allowed us to shoot completely in the dark,” Earnest explained to me over email. Of course, as the video makes clear, this is a slight—but only slight—exaggeration, in that Merrell uses a headlamp and small clip lights on his painting box to help illuminate the scene. When those lights are switched off, however, the landscape takes on a silvered, almost semi-metallic lunar glow, as if bathed in ambient light. Standing there in the darkness, Merrell comments on how working at night also comes with a peculiar kind of audio enhancement, with distant sounds riding the breeze with a peculiar clarity; and at one point a fortuitous lightning storm rolls by in the distance, as if to prove Merrell’s point with the atmospheric sonar of a thunder crash echoing over the otherworldly rocks of the National Park. [Images: Paintings by Eric Merrell; screen grabs from Nocturnes]. Read a bit more at the L.A. Review of Books, and don’t miss Earnest’s earlier film here on BLDGBLOG. (Related: In Search of Darkness: An Interview with Paul Bogard). One of many things that we’ll be looking at tonight in the Blackout seminar that I’ve been teaching over at Pratt in Brooklyn is organically generated electricity—things like virus batteries, biogeobatteries, sediment batteries, and more. [Image: From Christopher Nolan’s film The Prestige (2006)]. By way of getting there, though, we’ll be taking a very brief look at Christopher Nolan’s under-rated film The Prestige—specifically the scene in which we see a hillside covered in giant incandescent light bulbs, none of which appear to be plugged into anything but soil and all of which are powered wirelessly by a generator located over 12 miles away. The geological form of the mountain plateau becomes a shining grid framing our two featured characters. Although The Prestige does not suggest that this is what’s happening in this scene, what if the soil itself was powering these light bulbs? What if soil could be turned into a landscape-scale, distributed electrical device? Scientists have known that bacteria can create electricity when mixed with mud and seawater, and have even built microbial fuel cells around the little buggers. Now they have begun figuring out just how bacteria create electrical networks that serve as long-distance communication, at least on the microbial scale—the distances ranged up to 2 centimeters. Yet those few centimeters equal roughly 20,000 times the body size of individual bacteria. Imagining soil itself—the ground all around us—as a giant electrical transmission network is astonishing. And, again, while there is no mention of anything like biogeobatteries and their ilk in The Prestige, the very idea that perhaps someday we could plug light bulbs directly into the soil—an organic battery coextensive with the living surface of the earth—amazes me. [Images: From The Prestige (2006)]. And biogeobatteries are not even the only option here; there are also virus batteries. The future design possibilities are bewildering. Could deposits of virus-impregnated soil be used as electricity-storage devices in rural, off-the-grid areas? The researchers filled plastic columns with wet sand infiltrated with a nutrient compound (lactate), and allowed S. oneidensis to grow in this “fake soil.” Only the top of the column was in contact with air. Electrodes inserted at various heights up the columns revealed that, after about ten days, electrical charge was coursing up the column… threaded by a web of filaments between the bacterial cells. I’m reminded here of the work of Philip Beesley, which often uses self-fertilizing yeast-packs, gels, and seeds to create living geotextiles. In fact, a Beesley Battery doesn’t seem at all very off: a living mat woven through the soil, generating and storing electricity based on pre-existing bacterial activity in the ground. [Image: From Christopher Nolan’s The Prestige (2006)]. [Image: From The Prestige (2006)]. —and watch as everything around us starts to glow. [Image: “Lightning Bugs in York, PA,” by tom.arthur, courtesy of a Creative Commons license]. While traveling last week, I managed to re-read W.G. Sebald’s book The Rings of Saturn. At one point, Sebald describes two entrepreneurial scientists from the 19th century, who he names Herrington and Lightbown; together, we’re told, they had wanted to capture the bioluminescent properties of dead herring and use that as a means of artificially illuminating the nighttime streets of Victorian London. An idiosyncrasy peculiar to the herring is that, when dead, it begins to glow; this property, which resembles phosphorescence and is yet altogether different, peaks a few days after death and then ebbs away as the fish decays. For a long time no one could account for this glowing of the lifeless herring, and indeed I believe that it still remains unexplained. Around 1870, when projects for the total illumination of our cities were everywhere afoot, two English scientists with the apt names of Herrington and Lightbown investigated the unusual phenomenon in the hope that the luminous substance exuded by dead herrings would lead to a formula for an organic source of light that had the capacity to regenerate itself. The failure of this eccentric undertaking, as I read some time ago in a history of artificial light, constituted no more than a negligible setback in the relentless conquest of darkness. But it’s the idea that we could use the bioluminescent properties of animals as a technique of urban illumination that absolutely fascinates me. [Image: Bioluminescent billboards on one of the Galapagos Islands, by Octave Perrault]. 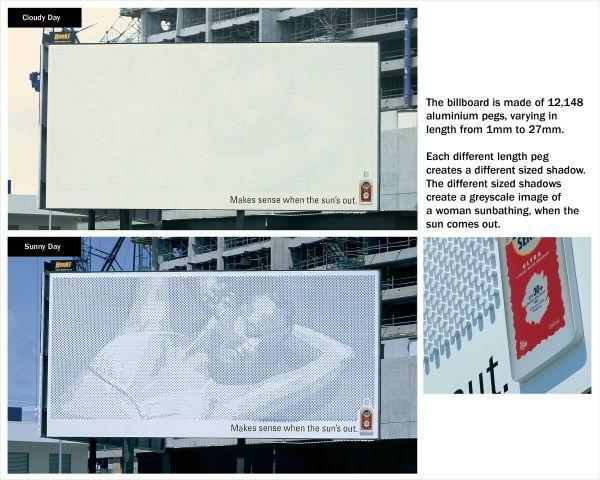 In many ways, Perrault’s billboards would be a bit like the River Glow project by The Living… only it would, in fact, be illuminated by the living. These bioluminescent bacteria would literally be a living window onto a site’s environmental conditions (or, of course, they could simply be used to display ads). Liam Young, the studio’s instructor, has also designed a version of these bioluminescent displays, casting them more fantastically as little creatures that wander, squirrel-like, throughout the city. They pop up here and there, displaying information on organic screens of light. [Image: Bioluminescent billboards by Liam Young]. I’m genuinely stunned, though, by the idea that you might someday walk into Times Square, or through Canary Wharf, and see stock prices ticking past on an LED screen… only to realize that it isn’t an LED screen at all, it is a collection of specially domesticated bioluminescent bacteria. They are switching on and off, displaying financial information. Or you’re watching a film one night down at the cinema when you realize that there is no light coming through from the projector room behind you – because you are actually looking at bacteria, changing their colors, like living pixels, as they display the film for all to see. Or: that’s not an iPod screen you’re watching, it’s a petri dish hooked up to YouTube. This is what I imagine the world of screen displays might look like if Jonathan Ive had first studied microbiology, or if he were someday to team up with eXistenZ-era David Cronenberg and produce a series of home electronic devices. Our screens are living organisms, we’ll someday say, and the images that we watch are their behavior. 2) As I mentioned in an earlier post, down in the Blue Mountains of New South Wales is a tunnel called the Newnes Glow Worm Tunnel. It is a disused railway tunnel, bored through mountain sandstone 102 years ago, that has since become the home for a colony of glow worms. [Image: A map of the Glow Worm Tunnel Walk, New South Wales]. Incorporate this sort of thing into an architectural design, and it’s like something out of the work of Jeff VanderMeer – whose 2006 interview here is still definitely worth a read. I’m picturing elaborate ballrooms lit from above by chandeliers – in which there are no lightbulbs, only countless tens of thousands of glow worms trapped inside faceted glass bowls, lighting up the faces of people slow-dancing below. Or perhaps this could have been submitted to Reburbia: suburban houses surviving off-grid, because all of their electrical illumination needs are met by specially bred glow worms. Light factories! Or, unbeknownst to a small town in rural California, those nearby hills are actually full of caves populated only by glow worms… and when a midsummer earthquake results in a series of cave-ins and sinkholes, they are amazed to see one night that the earth outside is glowing: little windows pierced by seismic activity into caverns of light below. 3) Several years ago in Philadelphia, my wife and I went out for a long evening walk, and we sat down on a bench in Washington Square Park – and everything around us was lit by an almost unbelievable density of fireflies, little spots of moving illumination passing by each other and overlapping over concrete paths, as they weaved in and out of aerial formations between the trees. But what if a city, particularly well-populated with fireflies (so much more poetically known by their American nickname of lightning bugs) simply got rid of its public streetlights altogether, being so thoroughly drenched in a shining golden haze of insects that it didn’t need them anymore? You don’t cultivate honeybees, you build vast lightning bug farms. How absolutely extraordinary it would be to light your city using genetically-modified species of bioluminescent nocturnal birds, for instance, trained to nest at certain visually strategic points – a murmuration of bioluminescent starlings flies by your bedroom window, and your whole house fills with light – or to breed glowing moths, or to fill the city with new crops lit from within with chemical light. An agricultural lightsource takes root inside the city. Using bioluminescent homing pigeons, you trace out paths in the air, like GPS drawing via Alfred Hitchcock’s The Birds. An office lobby lit only by vast aquariums full of bioluminescent fish! Bioluminescent organisms are the future of architectural ornament. [Image: A bioluminescent tobacco plant, via Wikivisual]. On the other hand, I don’t want to strain for moments of poetry here, when this might actually be a practical idea. After all, how might architects, landscape architects, and industrial designers incorporate bioluminescence into their work? Perhaps there really will be a way to using glowing vines on the sides of buildings as a non-electrical means of urban illumination. Perhaps glowing tides of bioluminescent algae really could be cultivated in the Thames – and you could win the Turner Prize for doing so. Kids would sit on the edges of bridges all night, as serpentine forms of living light snake by in the waters below. Perhaps there really will be glowing birds nesting in the canopies of Central Park, sound asleep above the heads of passing joggers. Perhaps the computer screen you’re reading this on really will someday be an organism, not much different from a rare tropical fish – a kind of living browser – that simply camouflages new images into existence. Perhaps going off-grid will mean turning on the lifeforms around us. [Image: The dark skies above Galloway Forest Park, Scotland, via the Guardian]. [Image: The Pleiades, photographed by Thackeray’s Globules, photographed by Hubble]. Nonetheless, Galloway Forest Park contains the darkest skies in Europe, and Steve Owens, co-coordinator of the IYA plans in the UK, is determined to gain recognition from the International Dark-Sky Association (IDA) as a lasting legacy for the 2009 celebrations. The IDA website itself contains everything that “locations with exceptional nightscapes” need to know to submit their application to be certified as “International Dark Sky Communities (IDSC), International Dark Sky Parks (IDSP), and International Dark Sky Reserves (IDSR).” Currently, there is only one dark-sky community in the world (Flagstaff, AZ), and just two dark-sky parks (the first, Natural Bridges National Monument in Utah, and the slightly less well-known Cherry Springs State Park in northern Pennsylvania). There are no actual reserves yet; indeed, the concept is still being thrashed out in partnership with UNESCO (who issued their own Starlight Reserve framework in 2007). [Images: The “center of the Milky Way,” photographed by the European Southern Observatory at al. ; the galaxy NGC 281, photographed by Ken Crawford of the Rancho Del Sol Observatory; and the Pleiades, photographed by Philip L. Jones]. The idea of a human-created dark sky park is fascinating, of course, as are the architectural and landscape modifications that must be undertaken by town councils and park management services in order to secure a qualifying Bortle score. For example, Observatory Park in Montville Township, Ohio, has been awarded provisional IDSP status (Silver Tier), contingent on “the completion of the park’s outdoor lighting scheme, visitor’s center, and enactment of outdoor lighting ordinances in surrounding townships.” The Geauga Park District submitted their 34-page Lighting Management Plan (read the PDF) in August 2008, detailing various proposals for the reduction of local skyglow (as opposed to natural airglow), light trespass, and glare. These include full shading for all light installations and lighting curfews, as well as strategic tree planting.